1998, at Wilmington, Delaware in the United States. "Nicholas and Alexandra presents the final chapter of tsarist Russia as it has never been told before." --Mikhail Piotrovsky, director, the State Hermitage MuseumThis magnificent and compelling volume reveals in unparalleled detail the luxurious world and private lives of Nicholas II, the last tsar of Russia, his wife, Alexandra, and their five children. It accompanies the largest collection of imperial family treasures ever to leave Russia: some 650 irreplaceable works of art, photographs, and personal and state documents, all superbly reproduced here.The book opens with a dazzling display of the extravagant tastes of the Russian aristocracy. Included are paintings, furniture, a gilded carriage, an imperial throne, ball gowns and uniforms, icons, and gifts from Tsar Nicholas to Empress Alexandra, including Imperial Easter Eggs from the renowned Faberg� workshops.Then, drawing on diaries, letters, and the familys own photographs of one another, many previously unpublished, is an intimate look at Nicholas and Alexandra from their betrothal to their horrifying murder. Items such as Alexandras notes of Rasputins prophesies and Nicholas 1917 abdication letter are elucidated by direct quotations or associated documents, including the memoirs of the commandant who organized the family's assassination.The related exhibition is on view at the First USA Riverfront Arts Center, Wilmington, Delaware, from August 1 to December 31, 1998.George Vilinbakhov is deputy director of the State Hermitage Museum, St. Petersburg, and a member of the commission that authenticated the remains of the imperial family.Sergei Mironenko, director of the State Archive, Moscow, also served on the authentication commission.Galina Komelova is head of the Russian department of the Hermitage. Alia Barkovets is deputy director of the State Archive. 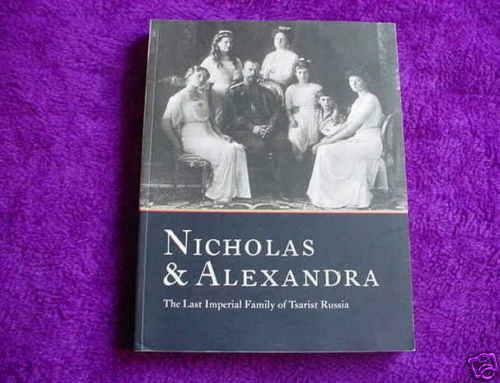 This magnificent, compelling volume reveals in unparalleled detail the luxurious world and private lives of Nicholas II, the last tsar of Russia, his wife, Alexandra, and their five children. It accompanies the largest collection of Imperial family treasures ever to leave Russia, on exhibit through Dec. 31, 1998, at the First USA Riverfront Arts Center, Wilmington, Delaware. 644 color illustrations.